This little pull-a-long Peter Rabbit is delightful, it is definately a favourite in our house and has been for years. Even the adults have been known to play with it. We think that this would make a gorgeous Easter present. Brilliantly fluffy, sensationally soft and fantastically sweet, they're created with the highest quality materials, exceptional manufacturing and that little bit of Beatrix Potter magic. Say hello to Peter Rabbit a delightful bunny. Undoubtedly the best loved of all of Beatrix Potter's creations, this brilliantly cheeky rabbit is immortalised forever as your child's greatest companion. 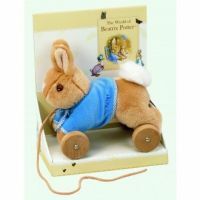 Set on smooth wooden wheels with a sturdy pull cord for hours of fun, Peter has soft brown fur, a white fluffy tail and is wearing his trademark blue velour jacket with blue gingham fabric edging and neck tie. His jacket has his name 'Peter' embroidered on it. 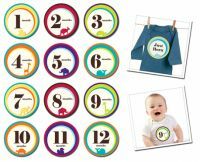 Your little one can take their Peter Rabbit with them on all their adventures as they learn to walk.